Update, December 1st: Following my line to the Lab, the ToS was re-issued with Section 10.1 corrected to reference Section 11.5 instead of the incorrect Section 10.2, which had been removed with the original December 1st update. This article has been amended to reflect the update. Clarifying of the arbitration provision in accordance with applicable Californian law. The alterations to reflect the fact the at the Linden Dollar Authorised Reseller programme is no more can seen in the massively foreshortened Section 4.7 of the revised Terms of Service, which once again make it clear that the only point of reference for the exchange of Linden Dollars for physical world currency may not occur anywhere outside of the LindeX, nor may Linden dollars be purchased other than via the LindeX. There has been speculation this relates to certain personal attacks directed towards Ebbe Altberg through the likes of Twitter. However, it would seem more likely (I would hope) that this section is intended to address similar attacks which have been made through the Lab’s own forums, etc., over which they have full jurisdiction. Section 10 contains the changes to the arbitration process, with section 10.1 being greatly streamlined in content and focused directly on the requirements of the Commercial Arbitration Rules of the American Arbitration Association (“AAA”). One error with these latter updates is that they still reference section 10.2, which has in fact been removed from the ToS as a part of the updates; something that has been raised with the Lab. Section 10.1 now correctly references Section 11.5. You may not sell, transfer or assign your Account or its contractual rights, licenses and obligations, to any third-party (including, for the avoidance of doubt, permitting another individual to access your Account) without the prior written consent of Linden Lab. This raises an interesting question around the subject of shared accounts – often used by groups where an account might be used by more than one person for administrative purposes, etc. While the sharing of account passwords has always been frowned upon, the revision to section 4.1 tends to suggest that these accounts could now be deemed as a violation of the ToS unless the Lab’s written consent is granted. I’ve written to the Lab on this point and am awaiting a reply. Those hoping this update might see a further improvement to the wording in Section 2.3 relating to IP rights will be disappointed. The section is untouched and remains as much a mess of a word salad now as it did following the “clarification” of July 2014. On Sunday, November 29th, NiranV Dean released Black Dragon 2.4.4.4 (or 4.0.0.36527, depending on your personal preference). This release incorporates three significant features from the Lab, as well as Niran’s own nips, tucks, tweaks and changes. First among the changes inherited from the Lab is the latest update to the Chromium Embedded Framework (CEF) implementation which is intended to provide modern media support (HTML 5.0, WebGL). Of possible greater interest to the vast majority of users is the addition of the Avatar Complexity rendering and the graphics presets, as found in the Lab’s Quick Graphics RC viewer. I’ve previously provided two overviews of these, in August and June of 2015, so what follows is a brief summary and examination of Niran’s implementation, starting with the graphics presets capability. 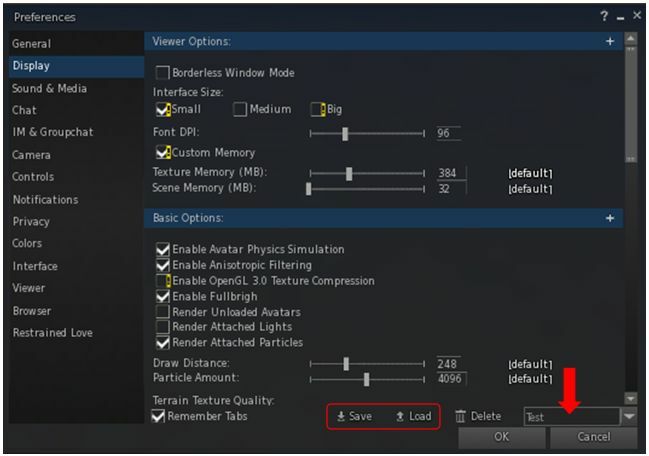 Graphics presets, a capability contributed by Jonathan Yap (see STORM-2082), allows users to create, save and use sets of viewer graphics options designed to meet a specific requirement, with the intent to help with viewer performance, and which can be used by any account logging-in to SL using the viewer on which the presets have been created. This means, for example, you can create a sets specifically for indoor use, limiting your draw distance, reducing levels of detail for things like terrain and sky and water reflections and so, boost your system’s performance when visiting stores, etc., while having another preset with all the bells and whistles enabled for photography. Then with a couple of mouse clicks, you can swap between these and any others you create to meet your needs as you travel Second Life, all without the need to fiddle with settings or relog. An issue with the official viewer’s implementation of graphics presets is that it requires the use of two rather clunky floaters which eat screen real estate. Niran avoids this by neatly integrating the core preset options (Save, Load and Delete presets) into the foot of the Display tab in Preferences. In doing so, he also makes creating a simple top-down flow through the Display tab options. This means that creating a new preset is simply a matter of running through the Display options, making sure those you want active are checked and those that you don’t need are unchecked, and that all relevant sliders are correctly adjusted. Then, when you’ve done so, enter a name for the preset group in the text box at the foot of the tab (arrowed above) and click the Save button – then repeat as required. You can also load an establish preset group from here by typing the name into the text box and clicking Load. Any unwanted presets can be removed by entering the name and clicking the Delete button. 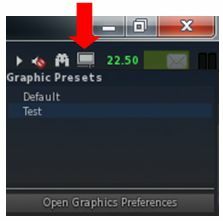 When it comes to swapping back and forth between preset groups, however, the quickest way to do so is via the Presets icon located in the top right of the viewer window. Hovering the mouse over this displays a list of all presets you’ve created; just click the name of the one you wish to activate. This list also include a button which will open the Preferences floater at the display tab, allowing you to quickly set-up a new preset or modify and existing preset (just make your changes and save to an existing preset name to overwrite it). As avatars can often be the single biggest impact on the viewer in terms of rendering, particularly in crowded places, Avatar Complexity has been introduced by the Lab as a mean by which those on lower specification systems can set a limit within their viewer for rendering particularly complex avatars (i.e. those with a lot of very high-resolution textures on them and their accessories, or using a lot of high-impact mesh and sculpt attachments etc). Any avatar exceeding this limit will then be rendered as a single, solid colour, vastly reducing the processing load on the user’s system. Because they are rendered as a solid colour, such avatars have been nicknamed ”Jelly Babies” after the sweet (candy) of the same name. Within the official viewer, the control for Avatar Complexity is a single slider (Maximum Complexity) which controls avatar rendering. 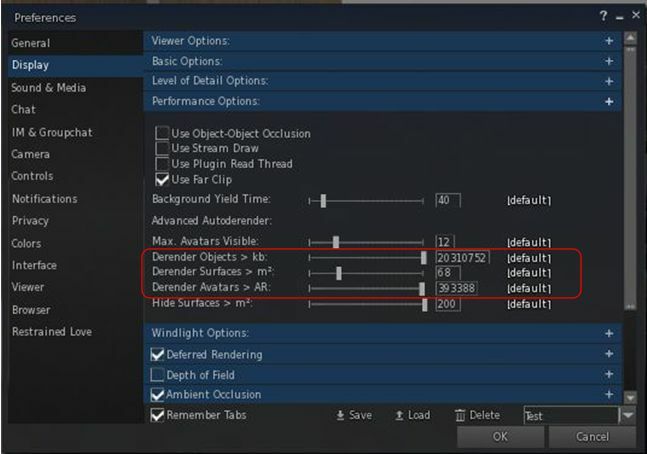 Within Black Dragon, Niran control is seemingly split between three sliders, Derender Objects > Kb, Derender Surfaces > m2, and Derender Avatars > AR. and some juggling between them may be required to achieve optimal results, if you play with all of them.